SP SETIA Bhd, the country's largest property developer by sales, is keen on taking on the government land recently identified to be developed by the private sector, its chief says. Prime Minister Datuk Seri Najib Razak on Tuesday announced that several parcels of land in Jalan Stonor, Jalan Ampang and Jalan Lidcol in Kuala Lumpur would be tendered out and developed by the private sector. "Yes, we're definitely interested in those pieces of land. But, like all developers, we have to wait for them to tell us the detailed policy, the tender procedures and so forth," the group's president and chief executive officer Tan Sri Liew Kee Sin said on the sidelines of Invest Malaysia 2010 yesterday. He said the group will be "more than happy" to tender for the project on its own or work as a joint venture with government-linked companies. 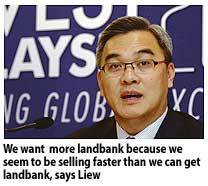 "We want more landbank because we seem to be selling faster than we can get landbank." SP Setia's sales for the current financial year ending October 30 2010 has been robust amid the improving property market, and the group foresees no problems achieving a sales target of RM2 billion. As at March 22, less than five months into the financial year, its sales had already reached RM900 million. This is almost double sales in the same period a year ago, Liew said. He said the property market remains strong on the whole and can probably take up to a 200-basis-point hike from where current morgage rates stand. Meanwhile, the group is still awaiting aprovals to launch its "green" mixed development project opposite Mid Valley Megamall in Kuala Lumpur. KUALA LUMPUR: SP Setia Bhd sales hit RM900mil in under five months in the current financial year ending Oct 31. President and chief executive officer Tan Sri Liew Kee Sin attributed the performance to the strong underlying demand for good properties, fuelled by an increasingly confident business and consumer sentiment as well as highly supportive financial sector. “This achievement clearly shows we are on track to meet the sales target of RM2bil for the financial year,” he said at the sidelines of Invest Malaysia 2010. For the first quarter ended Jan 31, SP Setia posted a net profit of RM38.2mil on revenue of RM363.9mil. “We’ll be the first Malaysian property company to hit RM2bil sales. We’re trying to push the limit higher,” Liew said, adding that sales were recognised only when the sales-and-purchase agreement was signed. He also said its sales were cyclical and the second-quarter performance may not be as “fast” (good). To a question, he said he expected an increase in mortgage rates this year. Meanwhile, Liew said the company was keen to bid for the parcels of government land that would be tendered out for development by the private sector as announced by Prime Minister Datuk Seri Mohd Najib Tun Razak. He said the company was interested in pursuing such opportunities along with other strategic collaborations with government-linked or government holding companies. “We welcome the Government’s move to monetise government assets via outright sales or joint ventures,” Liew said. He said prospects and opportunities for quality developers were plentiful and would only get better, as income levels rose and good landbank released for sustainable environment development. Meanwhile, Bloomberg reported that SP Setia planned a real estate project with a gross development value of RM1.4bil in Australia. It will be on 1.07 acres of land in Melbourne which SP Setia agreed to buy for A$30mil on Monday. The company expected to build about 850 apartment units and some retail shops there, Liew Kee Sin said in an interview. Main board listed property development company Hua Yang Bhd, will launch the Senawang Link, an integrated commercial and industrial development project, in Seremban. Located on a 11.2 hectare site, it has a gross development value (GDV) of RM45 million. Construction will begin this month on the Senawang Link, which comprises shop offices, semi-detached factories and industrial lots, the company said in a statement today. "We have earmarked the Senawang Link as an industrial hotspot, especially for those keen to operate strategically located factories, priced from RM251,000 onwards," said its chief operating officer, Ho Wen Yan. Strategically located along the main road of Jalan Tampin, the Senawang Link is also just next to the upcoming KTM Sungai Gadut Station, which is expected to be completed by 2010. Meanwhile, the Senawang Link is part of the RM1 billion worth of development, earmarked by Hua Yang, for this year. Among the others are One South, a mixed development project with a GDV of RM750 million in Sungai Besi, the RM45 million Seremban Country Heights development, the RM28 million Polo Park exclusive residential area in Johor Bahru as well as the RM200 million Symphony Heights Serviced Apartments venture in Selayang. Construction and property group Malaysian Resources Corp Bhd (MRCB), which is building up a war chest for land purchases, is keen to participate in the development of a large area of land in Sungei Buloh, its chief said. MRCB's controlling shareholder, the Employees Provident Fund (EPF) and the government will be forming a joint venture to promote the development of 1,214ha there into a new hub for the Klang Valley. Prime Minister Datuk Seri Najib Razak, in announcing the joint venture on Tuesday, said it would lead to over RM5 billion of new investments being made, with the private sector having enormous potential to participate prominently. "It is our task now to convince EPF to give us some work on the land. We'd like to participate in the development itself, a part of it, and also provide construction expertise and project management expertise for EPF," MRCB's chief executive officer Mohamed Razeek Hussain told reporters yesterday on the sidelines of the Invest Malaysia conference. 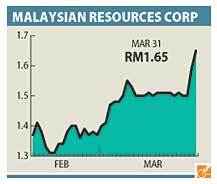 MRCB's stock gained 3.8 per cent to RM1.65 yesterday, as investors bet that the company would be a beneficiary of this project. It was the fourth most actively traded counter. The company is also looking to buy more premium land in Kuala Lumpur and this is partly why it recently undertook a rights issue to raise up to RM566 million, Mohamed Razeek said. "The war chest for acquisitions alone is about RM380 million," he said. The company currently has 1,618ha in Perak and another roughly 6 million sq ft of gross floor area to develop at its flagship development Kuala Lumpur Sentral, he said. The EPF, which now owns more than 33 per cent of MRCB after the renounceable rights issue, recently made a general offer to buy the rest of the company's shares at RM1.50 each. The exercise is expected to conclude on April 13.